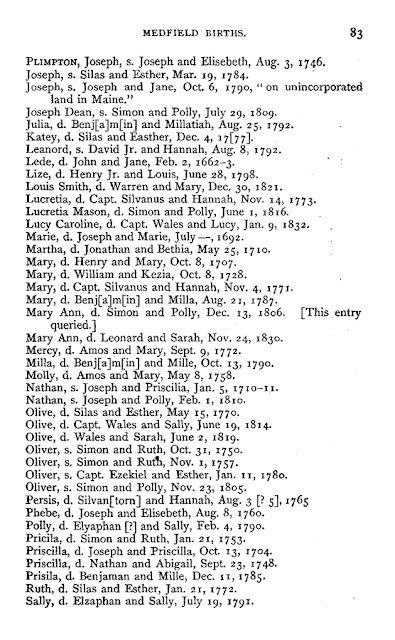 The treasure today is the 1772 birth record of Mercy Plimpton, daughter of Amos Plimpton and Mary Guild in the vital record book of Medfield, Norfolk County, Massachusetts. [PLIMPTON] Mercy, d. Amos and Mary, Sept. 9, 1772. Vital Records of Medfield, Massachusetts to the Year 1850 (Boston, Mass. 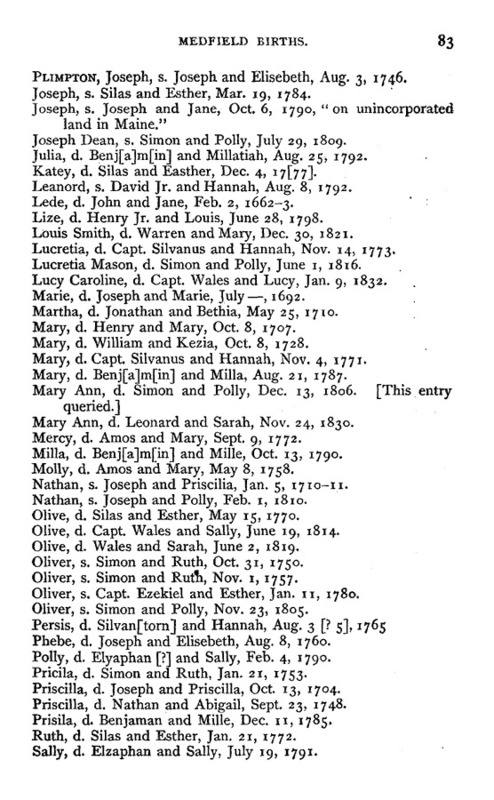 : New England Historic Genealogical Society, 1903), Births, page 83, Mercy Plimpton birth entry. Mercy Plimpton was the 5th child and third daughter of Amos and Mary (Guild) Plimpton, who married in Walpole in 1756, but all of the children were born in Medfield. Three of the children died before Mercy was born - perhaps that is how she received the name from her parents. Mercy Plimpton (1772-1850) married Aaron Smith (1765-1841) on 6 October 1795 in Medfield, Massachusetts, and they had 8 children between 1795 and 1815, including my ancestor Alpheus B. Smith (1802-1840). Aaron and Mercy (Plimpton) Smith are my 4th great-grandparents.